Poultry is the meat that comes from domesticated birds such as chicken, ducks, geese, and turkeys. Arroz con pollo - This is a Cuban recipe for chicken with yellow rice. Chicken tikka massala - This is a British dish (in fact one of the most popular dishes in the United Kingdom) inspired by Indian cuisine. It is made by cooking chunks of marinated chicken in an Indian-style curry sauce, and can be eaten with naan (Indian bread), or rice. This dish is so popular in Britain, that versions of the dish are sometimes used for pizza toppings and sandwich fillings! Coq au vin - This is a famous French recipe for chicken. It is made by fricasseeing the chicken with wine, lardons, mushrooms, and garlic. Traditionally, older roosters are used when making this dish, since they tend to contain more connective tissue, which results in a richer broth. Country Captain - This is a Southern recipe (it is especially popular in Georgia and South Carolina) for chicken curry stew. It is made made from chicken and onions, usually with raisins and almonds. Fesenjan - This is a famous Persian recipe. It is a sweet and sour pomegranate-walnut stew containing chicken or duck. 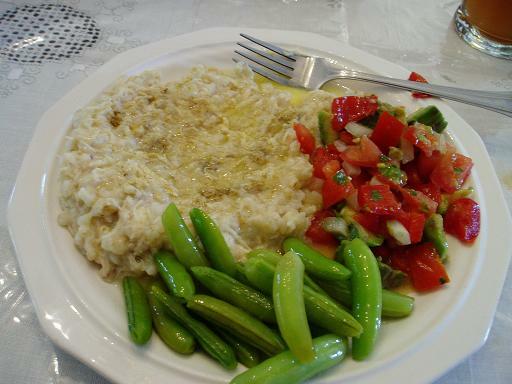 Harissa - This is an Armenian dish traditionally eaten on Easter day. It is a porridge made of stewed and boned chicken with coarsed ground wheat. Murgh makhani (butter chicken) - This Indian recipe, originally from the Punjab region, is made from chicken marinated in yoghurt and spices, then grilled or roasted. Pastilla - This is a sweet and sour pie dish from Moroccan cuisine. It usually contains squab (domestic pigeon), but can alternatively contain shredded chicken, or fish. Peking duck - This is a well-known Chinese recipe originally from Beijing. China. It is made by glazing a duck in syrup and then roasting it, although in in the United Kingdom (where the dish is usually known as "crispy aromatic duck"), it prepared using aromatic spices including five-spice powder to coat the duck, and then frying it. The key element of this dish, is the method of serving. The duck is carved in front of the diners, and then eaten wrapped in steamed pancakes (Mandarin: pinyin), which are also filled with scallions and plum sauce. 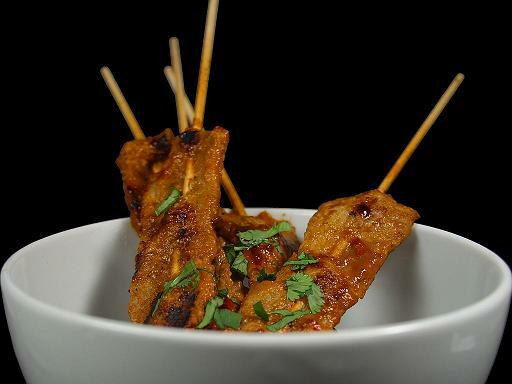 Sate (also known as "satay") - This is a dish originally from Indonesian cuisine, but popular throughout Southeast Asia and beyond. It is made by cooking diced pieces of chicken meat (although other meats and fish can also be used) on bamboo skewers cooked over a charcoal grill. Zuk (or Zhou) - This is Malaysian recipe for rice porridge (congee) contains chicken breast, fish slices, preserved eggs, salted eggs, and ground pork.